It is not often that the study of Renaissance bronzes can be described as intrepid. That, however, is exactly the word that comes to mind as one reads this pioneering and magisterial study by Charles Avery. Consider, for example, his account of the difficulties encountered by anyone wishing to look closely at the bells cast by Joseph de Levis (1552-1611/14) and his family firm in late 16th- and early 17th-century Verona. These, Avery notes, in many cases still hang in the “relatively inaccessible campanili” of remote country churches. To see them, the art historian must be agile enough to clamber up steep ladders, and “determined enough to fight off pigeons, bats and their excrement”, in order to gain access to the bell-chambers, where, even so, “the frameworks for ringing often stymie proper examination”. In his pursuit of De Levis and his works, Avery has been doughty in another sense. He is, of course, one of the greatest authorities on Renaissance and Baroque sculpture, author of standard works on Giambologna and Bernini among other subjects. Here, however, he leaves the well-trodden high road of art historian to investigate a forgotten byway. This book is the fruit of almost half a century of exploration. Avery’s first article on the subject dates from 1972, although his research began a few years earlier. At that point Joseph de Levis (also known as Giuseppe) was little more than a name. That he was known at all was due to his practice of signing and often dating the products of his foundry. This is what makes his work, and that of the relations, a suitable topic for scholarly detective work. Those signatures—effectively trademarks—make it feasible to assemble a comprehensive catalogue of the output of the family form. With dogged patience, over the decades Avery has done just that. His book contains a catalogue raisonné, meticulously divided into absolutely certain works, those cautiously attributed on stylistic grounds, and rejected attributions. The picture that emerges from this and the text is of an operation, partly in and partly outside the conventional history of art. The De Levis family business was originated by Joseph’s older brother, and continued by his sons and nephews after his death. As such, they made saleable objects such as bells, ink-stands, door knockers and mortars. Occasionally, Joseph’s projects took him into the territory of sculpture, as we normally think of it. He collaborated with an artist named Angelo de Rossi on a couple of fine bronze statuettes of saints for the church of San Giorgio in Braida, Verona. In this case, it seems De Rossi made the models of the figures and De Levis cast them. On a few ocasions, however, De Levis seems to have stepped over the border from craftsman to artist, and devised small figurative statuettes and one portrait bust. The results are perfectly respectable late Renaissance bronzes in the Venetian mode, but that is not the reason why De Levis and company are worthy of this close attention. It is the whole range of their output—and especially the luxurious but utilitarian objects they produced —that makes De Levis and company such a fascinating case. Some of these required aesthetic invention; others were made by three-dimensional collage, putting together borrowed imagery or stock motifs. One basin, for example, has on its inside bottom surface an imitation of Dürer’s engraving of a naked nymph being carried away by a sea monster. When the basin was filled with water, this would have been seen shimmering under the surface. It is such objects in which Avery delights and makes the reader share his pleasure. (It is hard to resist a text that contains such exclamations as “one must now address the intriguing question of door-knockers”.) Among the finest products of the De Levis workshop were fire-dogs, ink-stands and the table bells that 16th-century aristocrats used to summon the servants. (Avery points out that Pope Leo X has one conveniently to hand in the portrait by Raphael.) 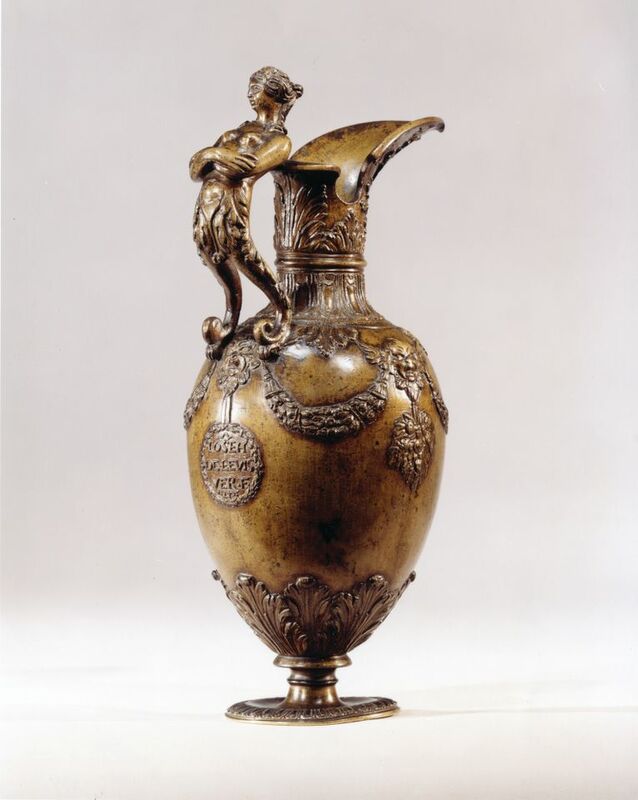 A splendid ornamental ewer, now in the National Gallery of Art, Washington, DC, which made a world record price at auction, is another example. Such things, and the job of the founder altogether, belong to a marginal zone outside the traditional heartland of “fine art”, which is just what makes them interesting. De Levis and his family were perhaps outsiders in Counter-Reformation Italy. The name might indicate the family was Jewish—highly unusual for an exponent of the visual arts in Italy at that date. The evidence, however, is conflicting; alternatively, they might have come from a village called Levo. This and many other questions concerning De Levis, Avery emphasises, remain open. Nonetheless, this is a superbly detailed, comprehensively illustrated, urbanely enthusiastic summary of what we now know: a venture into art-historically unexplored territory.